Halloween is one of my favorite holidays. Almost as good as Christmas, and you don’t have to buy presents, just candy, so it’s way easier. So, when we got the opportunity to take a Halloween cruise last year I jumped at the chance. My Halloween normally consists of me decorating my yard with tombstones and skeletons, and passing out candy to costumed children. Finally, I was getting my chance to be the one having all the fun. I spent weeks figuring out which couples costumes that my husband and I could wear, and then making them. Of course we had to be pirates, since my favorite movie is Pirates of the Caribbean. I got creative to save money, going to Goodwill and buying sheets for the shirts. Then I got lucky and found a pair of boots at a store going out of business for $10. Went to the dollar store for our props, and ended up buying decorations for our cabin door also. We were going all out. 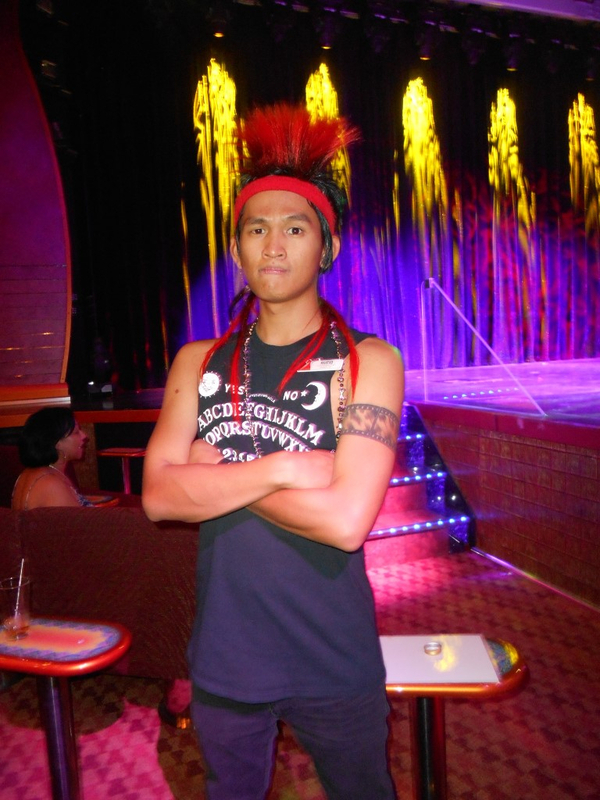 We sailed on the Carnival Magic Halloween cruise. First thing we did was decorate our Cabin door with a skeleton, and hang a Halloween Frankenstein and pumpkin from the ceiling. I also thought ahead and brought a small Halloween bowl with some candy in it for our room Steward, so he could enjoy the Halloween atmosphere a bit too. I have to admit that I ate a bit of his candy though. 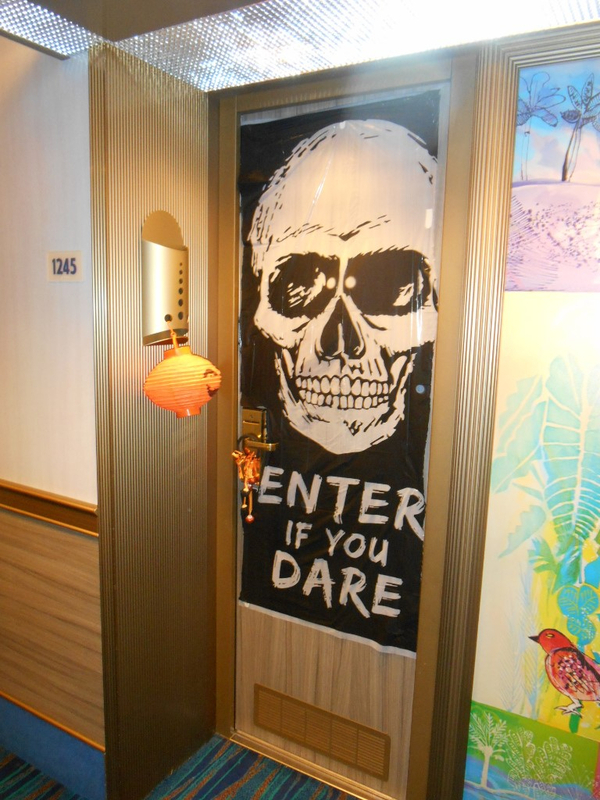 Walking up and down the cabin hallways, there were quite a few fun door decorations on the ship that cruise. Seems like everyone was in the Halloween spirit, but then why cruise on Halloween if you’re not going to enjoy? On Halloween day we ported in Amber Cove, Dominican Republic. That was a fun day, with us doing our first zipline ever. 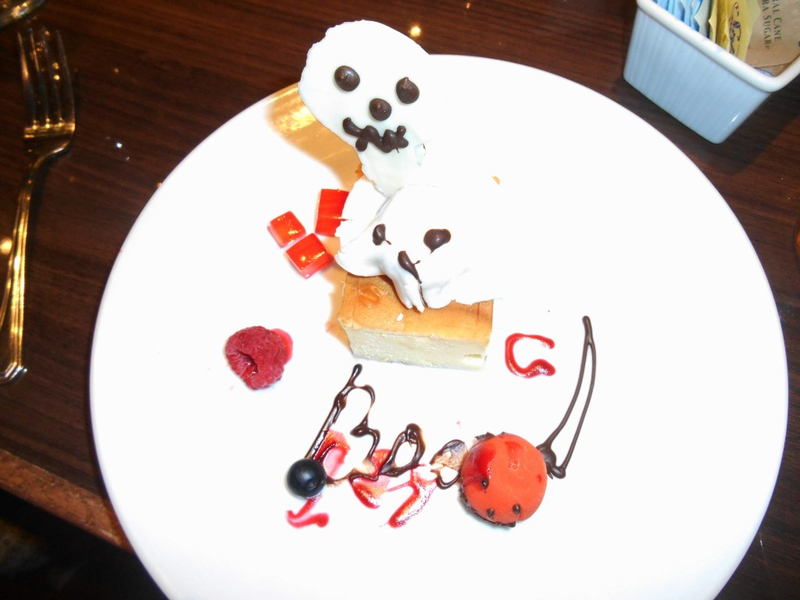 And then, after we ate dinner, where my waiter brought me “Scary Cake” for dessert, we got ready to party! I have not gone to a Halloween party in quite a few years, so it was a lot of fun just getting ready for it. 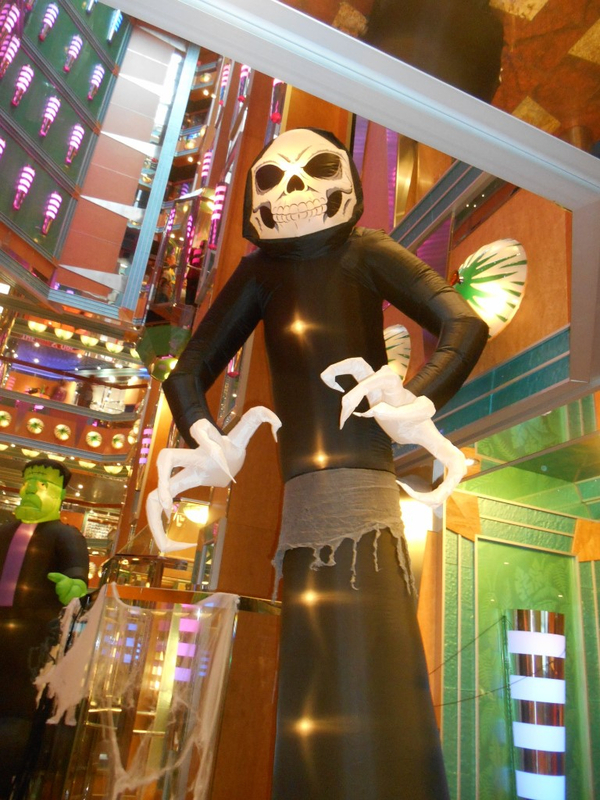 The ship was decorated everywhere with inflatable Halloween decorations. 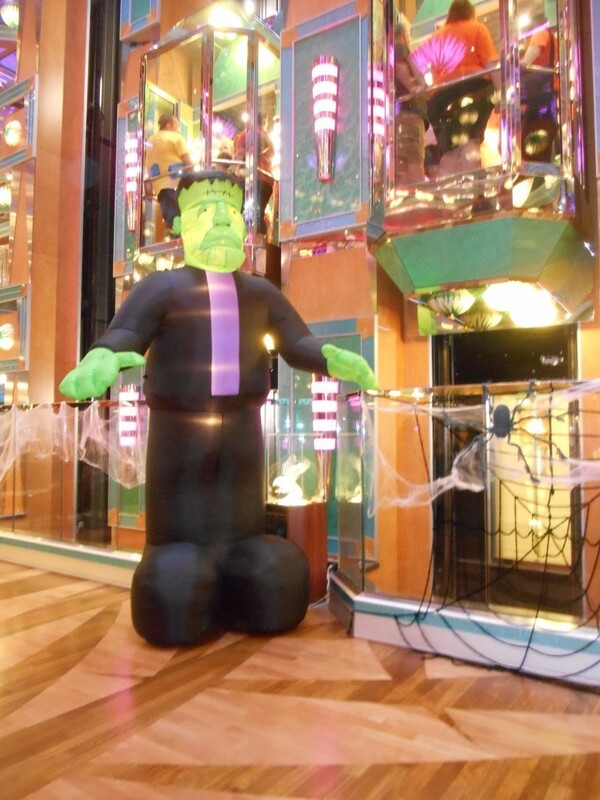 Even a giant Frankenstein in the main lobby. A lot of people were dressed in costume. It was a lot of fun just people watching, some of the costumes were so creative. Kids could trick or treat, there were parties all over, and costumes everywhere. Halloween music was playing. The always entertaining Reverend Dr. E was our Cruise Director, and he had the Mad Hatter costume from the Johnny Depp version of Alice in Wonderland, and another crew member, whose name was actually Rufio, looked just like the Rufio from Hook. I had to get a picture of him for my daughter. Other creative costumes were Fred and Wilma Flintstone, Captain Hook, the three witches from Hocus Pocus, and Barbie and Ken in their boxes. People are just so creative. One of my favorite experiences was something we just happened to stumble upon. We went out onto the Promenade deck just to get away from the costumed crowd for a while, and out there was a bluegrass band practicing for a private party. They were so good that we just sat there and listened until they stopped. Everyone seemed to enjoy it. The photographers had Halloween backgrounds of every type for those that wanted memories of that night. For the kids, there were Dr. Seuss backgrounds. We didn’t end up getting any pictures that night. We only buy one a cruise, and we wanted it to be on elegant night. Later in the evening after all of the parties, they had the costume judging in the main theater. I can’t remember who won, but there were some amazing costumes. There was even a transformer. I have no idea of how he got that costume onto the ship. It was really tall. And then Halloween was over, but I have some wonderful memories of my first Halloween party in many years. I want to do it again. Maybe next year. I still have my Pirate costume! See below for more of our pictures from our Halloween cruise. 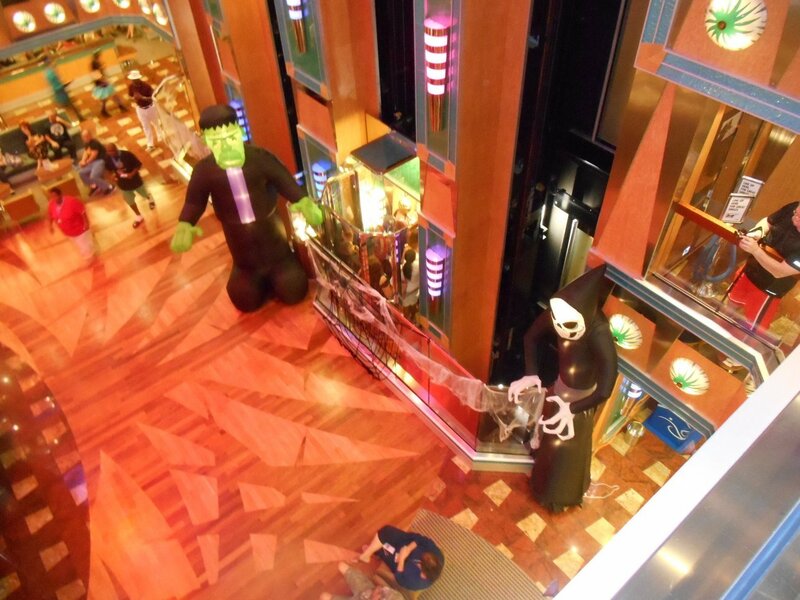 This entry was posted in Holiday Cruising and tagged balcony, booking a cruise, Carnival, carnival cruise, cruise blog, cruise food, cruise port, cruiseblog, cruising, halloween, halloween cruise, quietcruiser, royalcaribbean, ship on September 18, 2018 by The Quiet Cruiser. ← With Hurricane Florence on the way…what should I know when cruising? I’m not much on Halloween but even I would have fun on this cruise! Hmmm, thinking about my costume! We had so much fun with the costumes. Thanks! That looks like brilliant fun! I’ve never sailed at Halloween, but Christmas is always fun on ship. I’m also amused by the Transformer. Do you reckon the costume fitted under the bed when it wasn’t needed? Or did it have to stay in the shower? I loved the Transformer. I have no idea where he stored that costume. Maybe he had a suite. That was an amazing party!